US President Barack Obama reaffirmed on Wednesday his desire to strengthen the bilateral relationship with Russia during talks with Russian Security Council secretary Nikolai Patrushev, said National Security Council spokesperson Caitlin Hayden. Obama briefly joined a meeting between Patrushev and National Security advisor Tom Donilon in Washington. “The president reaffirmed his desire to strengthen the bilateral relationship, including US-Russian economic ties,” Hayden said in a statement. 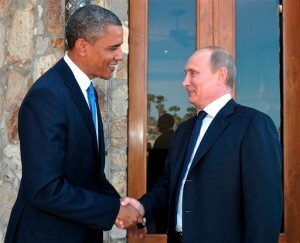 “The president noted he looked forward to seeing President Putin in June at the G8 Summit,” the statement said. Patrushev is currently on an official visit to the United States, where he was expected to hand over to Obama a letter from Putin in response to Obama’s message that Donilon brought to Moscow a month ago. “The dialogue has not disappeared,” Russian foreign minister Sergey Lavrov had said, referring to the Russia-US agreement to start the 2+2 (foreign and defence ministers) talks. The two countries have already drafted a schedule of their contacts till the end of the year, he added.